More bad news for the Hamilton Tiger-Cats. A day after losing to the Edmonton Eskimos, pushing first place in the East Division further out of reach, the Hamilton Spectator's Drew Edwards is reporting CFL sources have told him Andy Fantuz's injury is a serious one, a torn ACL that will end the veteran receiver's season. It was a non-contact injury for Fantuz, who fell after trying to make a cut on a receiving route in the first half of the Tiger-Cats 29-26 loss to Edmonton. Fantuz is scheduled for an MRI this coming week to confirm the extent of his injury, according to Edwards' report. The loss is a big one for the Ticats with just one regular season game to go before the playoffs. Fantuz, a Canadian, is the team's leading receiver with 101 receptions for 1,059 yards and five touchdowns. The 32-year-old was enjoying a nice comeback season after injuries had cut short his previous three seasons. 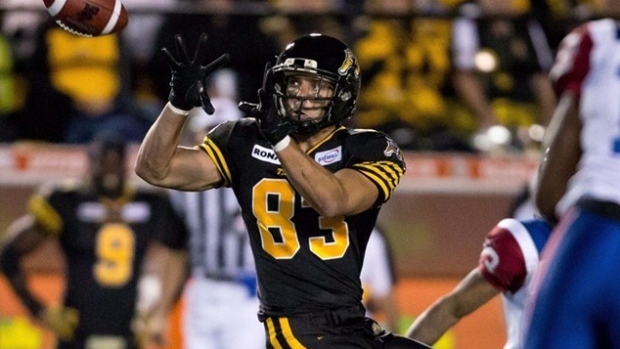 The 1,059 receiving yards were the second most of Fantuz's career and most since joining the Ticats from the Saskatchewan Roughriders, and a brief stint in the NFL, in 2012. In better news, Ticats defensive back Derrius Brooks, who was carted off the field Friday against Edmonton, tweeted Saturday morning that x-rays came back negative. Thanks for the prayers everyone. X-ray came back negative and ready to get back to the drawing board tomorrow!! !